Producing handmade brass watercolour palettes. Please note: The waiting time is currently upto 15 months. 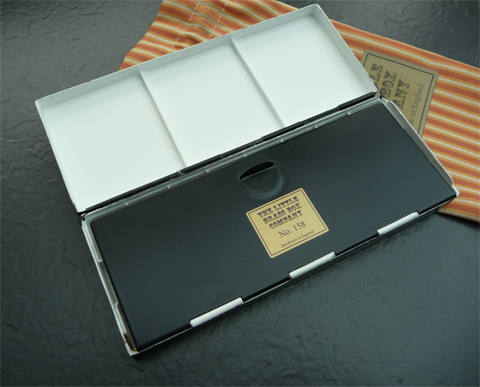 All of my watercolour boxes are hand-made out of brass, including the hinge pins. There are currently seven colour options, Ruby Red, Honeysuckle, Cirrus Blue, Dark Blue, Satin Black, Dark Green, Deep Maroon or for a small fee of £15 ($22.50) you can pick your own from this chart. Palettes are available with various options, please see below. Please click here for prices and ordering. Roberson Style Paintbox: 5 7/16" x 3 1/2" x 1 5/16" (139mm x 90mm x 35mm). Also available with extra mixing wells in the side flaps, finger ring or thumb hole. Can be finished in any colour or for a fee of £20, polished/lacquered. 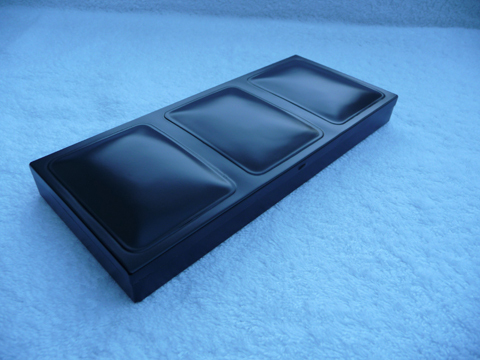 Palette tray: 5 3/16" x 3 1/4" x 7/16" (131mm x 82mm x 10.5mm) with 16 full pans or 12 with the thumb hole option. Anna Hornfeldt takes a look at the Roberson. 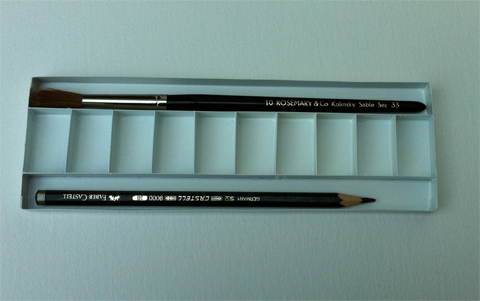 FW Studio Palette: 8 1/4" x 5 1/2 x 1" (210mm x 135mm x 25mm). With 3 deep mixing wells in the lid, large fold out removable flat area, 2 rows of 10 fixed full pans and removable mixing tray with a further 3 deep mixing wells. 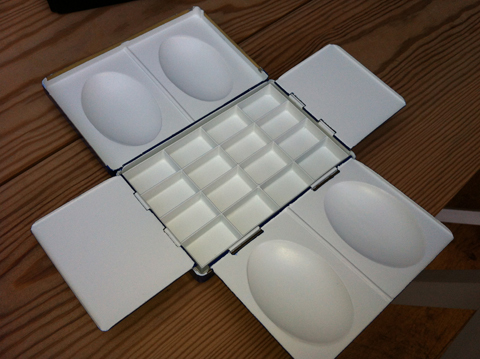 Also available with extra 10 or 20 full pan removable palette trays. That means it's possible to have upto 40 full pans in this box! A review of the FW Studio palette by Tom McQuiggan. Binning Monro Style Palette: 9 1/2" x 4" x 1" (243mm x 104mm x 25mm). Weight 13 1/2 ounces (383g) or1lb (454g) with flap attached. Removable mixing tray and flap as standard. 16 paint wells. 6 deep mixing wells. 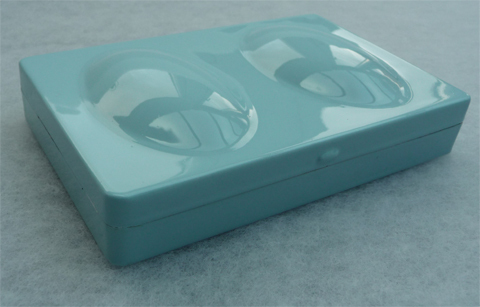 You can also specify a 14 full pan tray if you want more colours. Can be made left or right handed, please specify when ordering. John Haywoods review of the Binning Monro. Travel Palette: 2 1/8" x 2 7/8" x 3/5" (54mm x 72mm x 15mm). 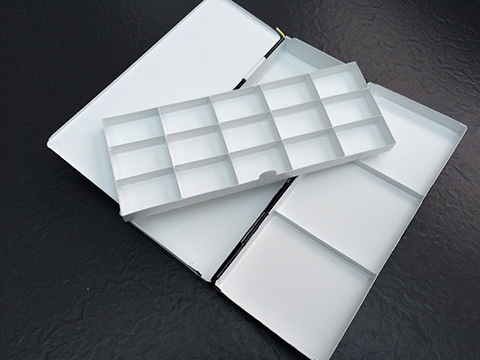 With a removable 16 pan palette tray and a hinged front flap. 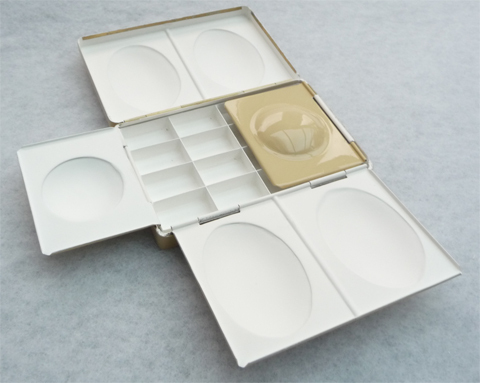 All travel palettes are fitted with a finger ring. A water bucket is also available, as are side flaps, please see the pictures below. Please note: As the Travel Palette pans are small, they can only be used with tube paint, 'half pans' will not fit. 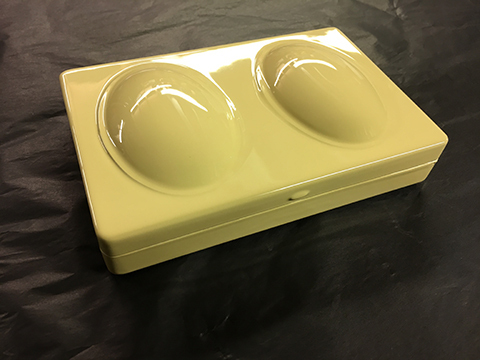 Weight with water bucket, side flaps and tray 170g or 6oz. A look at the Travel Palette by Luna Howell. Plein Air Palette: 6 3/4" x 2 3/4" x 15/16" (171mm x 70mm x 23mm). Weight 10 1/2 ounces (241grams). Can be finished in any colour or for a fee of £20, polished/lacquered. Also available with left or right handed finger ring. 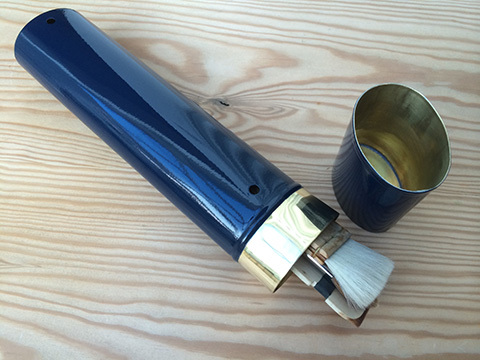 Brush Box/Tube: All brass construction. Designed with 4 air holes to allow brushes to dry out, with the lid doubling up as a water bucket. Can be finished in any colour. Sizes: 305mm (12") 254mm or (10"). These sizes can be adjusted to your requirements. Dark Green 'Roberson Style Paintbox'. 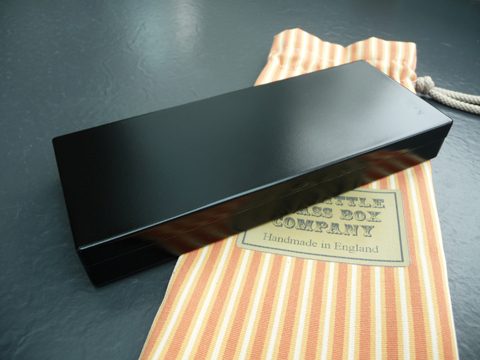 Satin Black 'Roberson Style Palette'. The Honeysuckle 'Roberson Style Paintbox'. 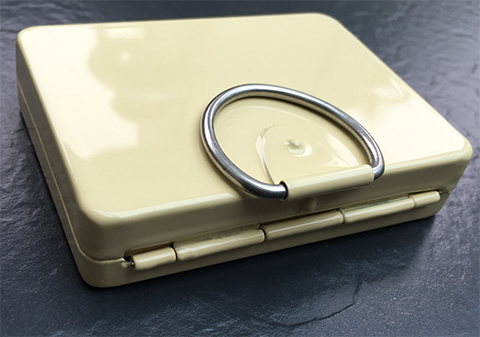 Opening the outer lid reveals an enamelled mixing surface and colour of the inner lid. 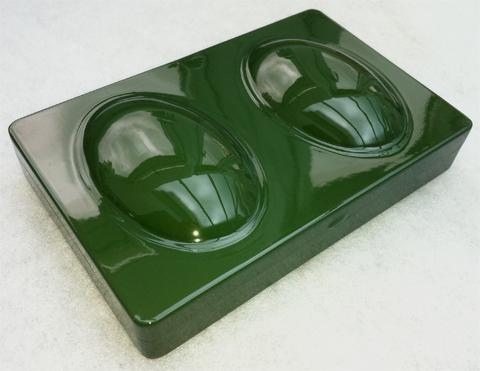 The outside of the flaps are also finished in the chosen colour, Dark Green in this palette. Please note there is an option to have further mixing wells in the flaps. 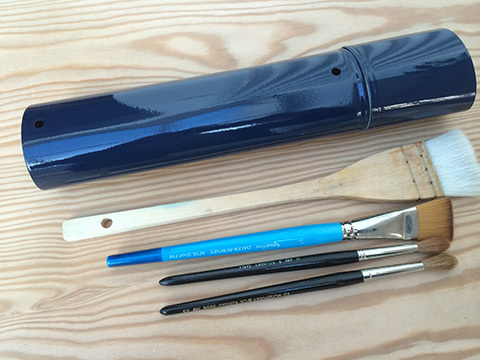 The squared edges around the mixing wells help to remove excess paint from your brush. The fully open paintbox revealing all the enamelled surfaces and removable palette tray. 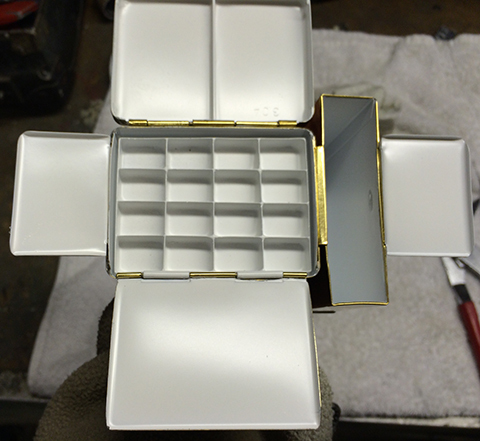 I can make the paintbox like the original Roberson paintbox with a finger/thumb hole and 12 full pans. Otherwise I can provide a finger/thumb ring under the paintbox. The Cirrus coloured paintbox, again with white enamel mixing and palette areas. Finger ring option on a Honeysuckle paintbox. 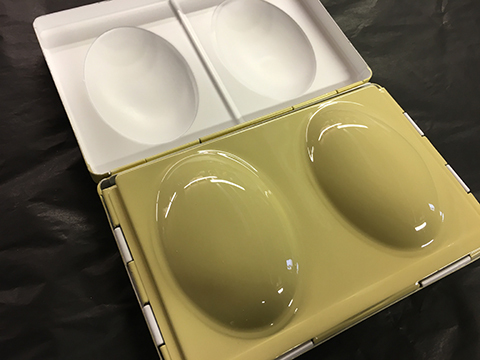 Thumb hole option with 12 full pan palette tray. Can also be fitted with 16 full pan palette tray. FW Studio Palette. Based on a palette used by James Fletcher Watson. Shown in Deep Maroon. A review of the FW Studio palette by Tom McQuiggan. The FW Studio palette with 20 full pans, removable mixing tray, large flat mixing area and 3 deep mixing wells in the lid. There are a few options for this palette to increase the number of pans. 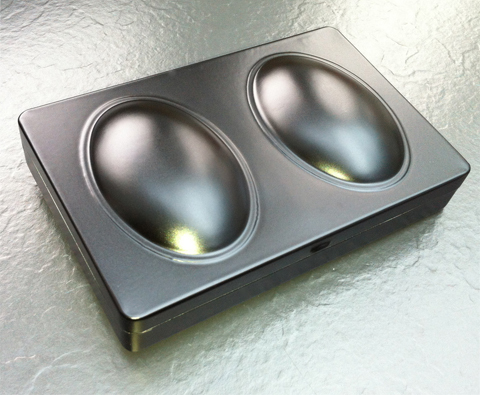 Optional 10 pan tray for the FW Studio Palette. 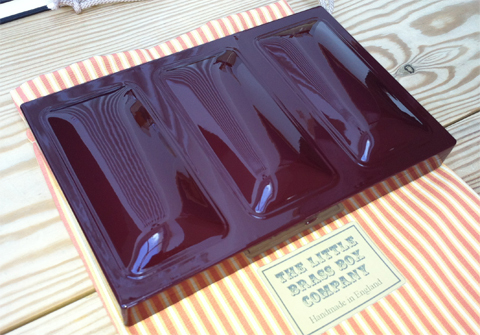 A 20 pan tray option is also available. The 'Binning Monro Style Palette'. 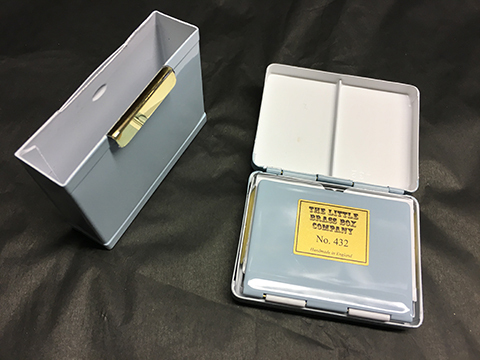 This light weight brass palette only weighs 383grams (with the flap removed), comes as standard with left or right handed thumb hole, removable tray and large flap. John Haywoods review of the Binning Monro. The 'Binning Monro Style Palette'. 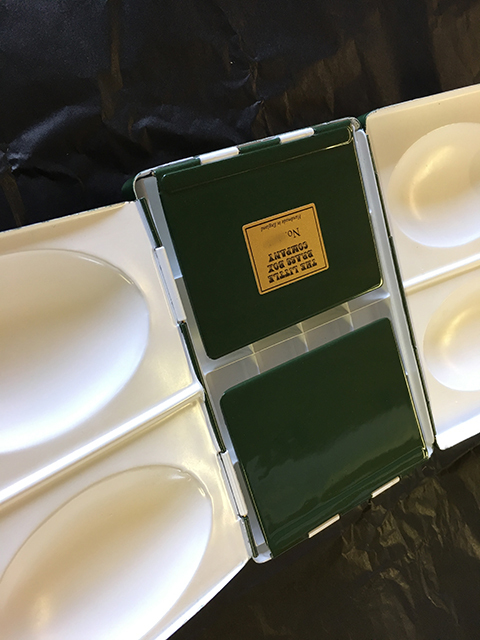 Opening reveals the ultimate in classic watercolour palettes, large removable flat mixing area, 6 deep mixing and 16 paint wells, 4 of which are half pan sized, for those rarely used but couldn't be without colours. 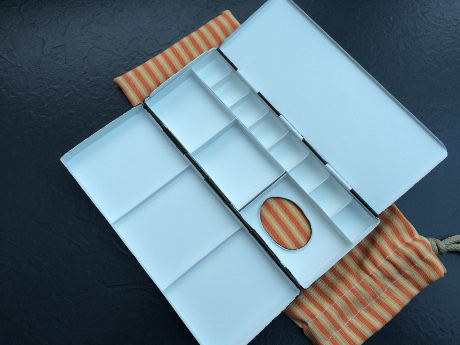 The tray is also removable for easy cleaning. Introducing the Binning Monro "Hake". With 15 large and 4 small paint wells. Priced the same as the standard 'Binning Monro Style Palette', please specify which one you would like when ordering. The Travel Palette. All Travel Palettes include a finger ring as standard. Please state if you would rather not have a finger ring. 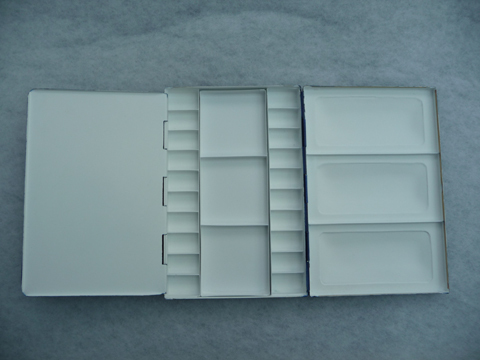 The Travel Palette features removable side flaps. They neatly fit inside the box when closed. 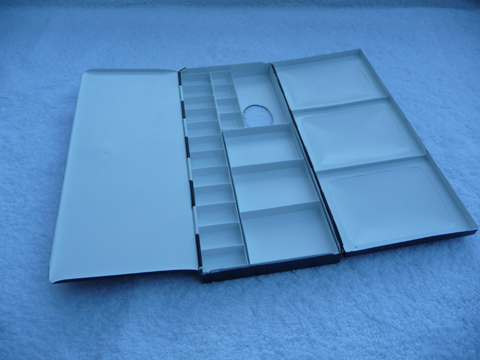 The 16 pan removable palette tray is standard. The whole palette quickly closes down, all fitting into the water bucket and then your pocket. Introducing the 'Plein Air Palette'. As with all my palettes, all brass hand made construction. With 16 half pans, will take either tube or cake colours. A robust palette for everyday use. Please let me know if you would prefer a deeper lid. 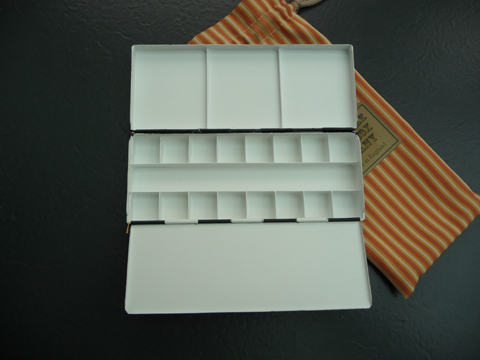 Opening the 'Plein Air Palette' reveals the flat mixing flap and three wells in the lid. Plein Air removable 15 full pan tray version. 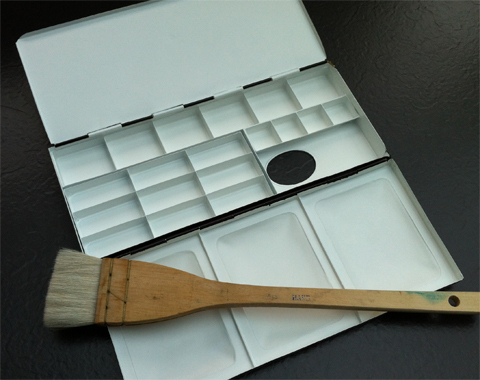 Plein Air thumb hole version with a removable 'two mixing well' tray. 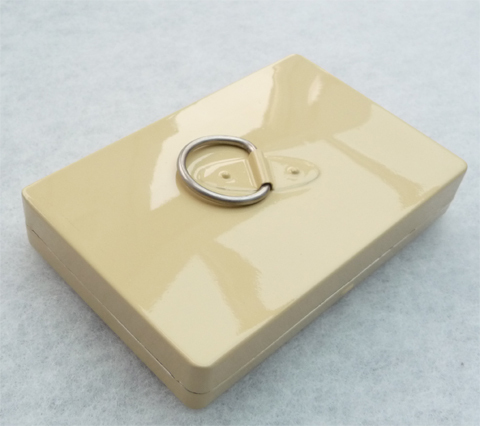 Brush Box/Tube, all brass construction, can be finished in any colour. Shown here in the Dark Blue 12" option. Sizes: 305mm (12") or 254mm (10"). These sizes can be adjusted to your requirements.